random acts of Christmas kindness. RACK. In a world where we’re constantly reminded to put ourselves first, it’s even more important that around the holidays we, as Christians, spread Jesus’ love and put others before ourselves. We’ve all heard of doing random acts of kindness.. but have you heard of RACK? RACK stands for random acts of Christmas kindness. This version is a Christmas countdown that will encourage children and remind ourselves to give, serve and help others throughout the holiday season. And if you’re thinking you just don’t have anymore time to add one more thing to your already busy schedule, think again. This is such a simple activity that will help us all experience the true meaning of this glorious season. 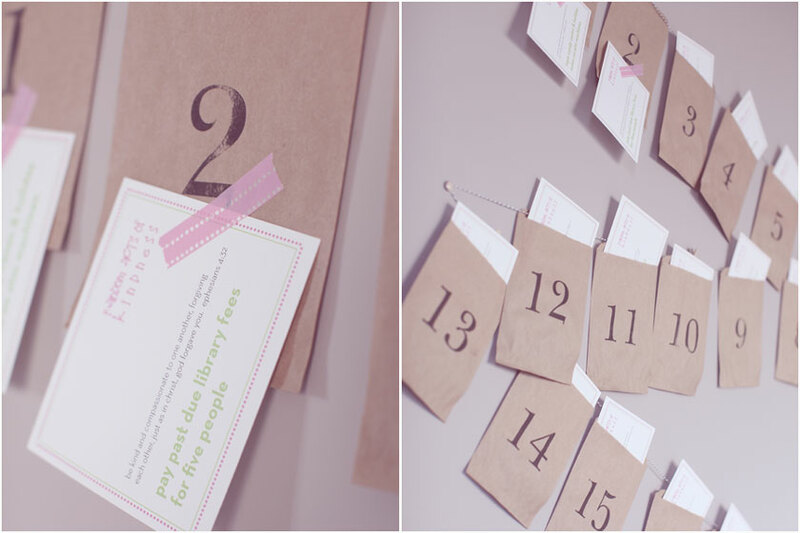 At it’s simplest form, put together twenty-five envelopes and within each envelope have an activity written. The night before, pull out the next day’s activity and talk with your family about what you’re going to do. If you want to go the extra mile, have a scripture verse associated with each activity so that as a family you can talk about what the verse means to each of you. There is a whole host of activity ideas that you can choose from.. something even as simple as collecting canned goods for a local food pantry. A more extensive list of activity ideas is listed below. As you complete each activity, you can leave a card behind letting the recipient know they’ve been RACK’ed. And hopefully they will continue to share the love of Jesus with others. I know of a few families who have done this sort of countdown in the past and they have really enjoyed it. Not only were the children really excited about each day’s activities, but they were so anxious to help out others in their community. My husband and I plan on doing this just the two of us.. as a simple reminder that we are here on earth to serve others and to spread God’s love to those around us. While our intention is to serve and bless others, we in turn become the ones who are truly blessed. It truly is far better to give than to receive.. Okay, so it’s not exactly “almost” Christmas.. but it is almost time to start decorating. And who out there doesn’t like to take photos of all of their decorations..? No one. We all love photos of our Christmas trees and of our outdoor lights.. but, before you start snapping away… take a glance at these tips to ensure you get the best Christmas photos possible. 1. Don’t use flash. Everything about Christmas screams warm and cozy and a hard flash is going to do the exact opposite of what you want. The image may come out crisp and clean, but it will also ruin the mood of your environment. If possible, use natural light- go outside or open up the curtains and let the sun shine in. (And this goes for all photos.. natural light is always the best possible kind of light.) If you’re indoors, turn on some lamps (just don’t use the overhead light). And if you’re photos end up a little blurry, use a tripod. Don’t have a tripod? No worries. Balance your camera on a table or chair. Even if you think you’re being completely still, you’re not. The littlest amount of hand shake can hand quite a bit of blur to a photo. 2. Use Christmas lights. We all love decorating the house with them so use them in your photos. If you’re taking photos outside, don’t wait until it’s really dark outside. The best time to photograph outdoor lights is about thirty minutes after the sun goes down around twilight (nope, not a reference to the movie). There’s still some light in the sky will help yield the brilliance of the lights while maintaining the details in the shadow. If you’re trying to take photos of your precious Christmas tree, just make sure a few other lights around the room turned on- this will basically give you the same effect and remember to keep the overhead light off. 3. Turn off AUTO White Balance. By turning off the white balance feature you are going to capture the exaggerated colors that the holidays have to offer. All cameras (even point and shoot cameras) have this ability- just check your owner manual to be sure how to do it as each camera is different. If you don’t want to turn off white balance altogether, you could experiment with the other manual settings to find a color balance that best suits your atmosphere. Don’t get frustrated though… it’ll take some trial and error before you find the perfect setting. 4. Capture the moment. Sure, a photo of the kids in front of the Christmas tree is a classic, but don’t forget to take candid photos along the way. Photograph your child hanging ornaments on the tree or in the middle of baking cookies covered in flour. Not only will photos like that create memories, but they’ll also tell the story of your families Christmas traditions. 5. Be creative. While you don’t want to miss the shots that are perfectly obvious, don’t forget about the details or different angles. If you have a mirror in the room where your tree is, take a photo in the mirror’s reflection capturing the tree. Get up close with some of your ornaments and capture the detail. (If you’re in manual mode, turn your aperture way down so that the only thing in focus is the ornament and not the tree limbs behind it.) Cover your little one in Christmas lights as if they’re all tangled up in them. Zoom in on your table’s centerpiece. Take a picture of an ornament with you or your child’s reflection in it. And if you decorate differently year to year, you’ll definitely want to make sure you photograph all the different details in the decor. The possibilities are endless. You may even take a photo that will be perfect for next year’s Christmas card.. who knows?!? To get all the details, make sure your aperture is turned all the way up- F16 or higher. Keep your ISO has low as possible to prevent grain or noise in your image and for the best color saturation. But with these settings, you’ll most likely have a higher ISO than you may expect– experiment with different ISO settings in order to get the right amount of light in your image. With a low ISO and a high aperture, you’ll need a really slow shutter speed in order for the camera to capture all the lights. A shutter speed that is open for at least 10+ seconds would be ideal. But, you’ll need a tripod or a flat surface in order to keep your camera stable for that length of time. If your camera has a timer on it, use it. The littlest amount of movement, even just pushing the shutter button, will move your camera and potentially blur your shot. Like I said before, your aperture needs to be turned way down- around 1.2 if your camera allows. This means your aperture is wide open and your image will have lots of blur. You’ll need to focus on the part of the image you want completely clear and then the rest of the image will be blurry adding emphasis on your main subject. Your ISO can vary here- but having a lowest possible ISO is ideal. Remember, the lowers the ISO- the less grainy your image will be. Somewhere around 400 should be good. Shutter speed may also vary, but a 60th (1/60) of a second should be a good setting- any slower and you’ll need a tripod so it doesn’t record any shaking from your hands.